The Netherlands is home to some of the greatest artists of the world and plenty of museums to show off their works. The likes of Van Gogh and Rembrandt were inspired by its people and countryside. There are also many quaint small towns and villages that welcome explorers with open arms and people ready to share their culture and knowledge of history with those willing to take the time to listen. Come to know the hardworking people of this rugged fishing village that still keep to many traditional ways of life. Volendam is a town in the Netherlands in North Holland, situated 20 kilometres north of Amsterdam. In the town you will find many Dutch clichés, such as the traditional dress and costumes and the wooden shoes. The traditional dress here, which is one of the best known examples of ancient clothing in the county, are still worn by some today in their daily lives. Many people travel to visit Volendam to see a traditional Dutch village. This is the capital city of The Netherlands, with a population of about 1.5 million in the metro area. It is known for its rings of canals, the Red Light District, the Anne Frank House and its famous museums (Rijksmuseum, Van Gogh Museum, etc.). Amsterdam has a rich history in commerce, mostly due to the country’s colonies all over the world, and this gives the city a fascinating flavour and diverse population even now. There are great restaurants and shopping, and it is a very comfortable place to walk around in. It is also a great starting point from which to explore The Netherlands and beyond. 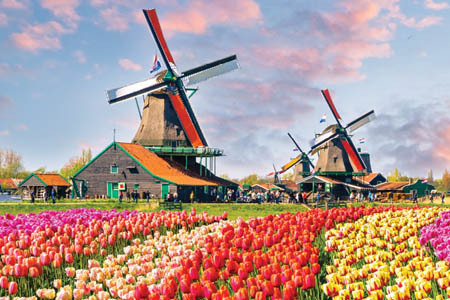 Snap the perfect photo as you pass the Dutch windmills that dot the countryside. The Netherlands are home to the oldest and tallest windmills. The windmills served many uses, but the most important was pumping water back into the rivers so land could be farmed. Not every windmill looks the same and they all vary in architecture. The position of the sails on a windmill are used to convey messages like a birth or death in the family, a wedding, or a call to come to the windmill. Arnhem is a large city located in the eastern part of the Netherlands on the banks of the River Rhine. The city’s origin dates back to the 12th century. Today, Arnhem is known as the site of one of the most famous battles of World War II: the Battle of Arnhem which took place in September of 1944. Marvel at the brilliant colours of the world’s most beautiful spring garden. Keukenhof is a large flower garden in Lisse, the Netherlands in the south of Holland. It is the world’s second largest flower garden at 79 acres in size. Keukenhof plants over 7 million flowers throughout the gardens each year. The gardens are open March through May for visitors to enjoy. Enjoy a simple blend of local ingredients and traditional favorites. The Netherlands is filled with many dishes that are special to them. Some of these are: thick Dutch fries, stroopwafel, dutch herring, bitterballen and many more to try. Explore a different way of living as you cruise among the vital waterways of Amsterdam. A UNESCO World Heritage site since 2009, the Amsterdam Canal Belt welcomes 3 million passengers every year. The canals were originally dug for water control and military defence for the city and over the years grew to a new type of transport for people and goods. Cruising along at a leisurely pace, today's boats sail through famous landmark canals such as Gentlemen's Canal, Emperor's Canal and the Prince's Canal. Amsterdam's botanical gardens is a popular attraction for both Dutch and international visitors. The collection is famous for its trees and plants, some of which are on the "endangered" list. The gardens have been collecting species of flora ever since the 17th century and are important sources of exotic species for both commercial and medicinal uses. Recent additions to Hortus include a huge hothouse, which incorporates three different tropical climates. Try Dutch herring- the Dutch way. Herring is a small fish that is very popular amongst the Dutch people. Go to the Waterlooplein Market, Amsterdam’s oldest and most famous flea market. Try the tasty caramel-like syrup filled cookie that was first made in the city of Gouda. It's time to wander, to wonder, and to awaken your soul. Title* Please Select... Dr. Mrs. Mr. Ms.